How do you see the strengths of Swissphone as a communications solution provider? The continuity of the business is one of its strengths as well as the tradition of the company, the reliability and the trust that we’ve built up – with our customers but just as importantly with our employees. We have a very highly motivated and talented group of more than 200 people around the world who really do contribute every day to Swissphone’s success. Part of the strength of Swissphone, as the name implies, is that we’re a Swiss business. We are very precise in what we do in terms of forward planning, in terms of applying the knowledge that has been gained from the market to our products and to the quality that we put into our research and development and production in Switzerland. And because we’re so close to our customers and so close to the market, we can adapt our technology and systems and networks to the needs of the market as they change. Can you give some examples of that evolution of the market? This has been an ongoing trend within Swissphone – we’ve become much more solution-driven. 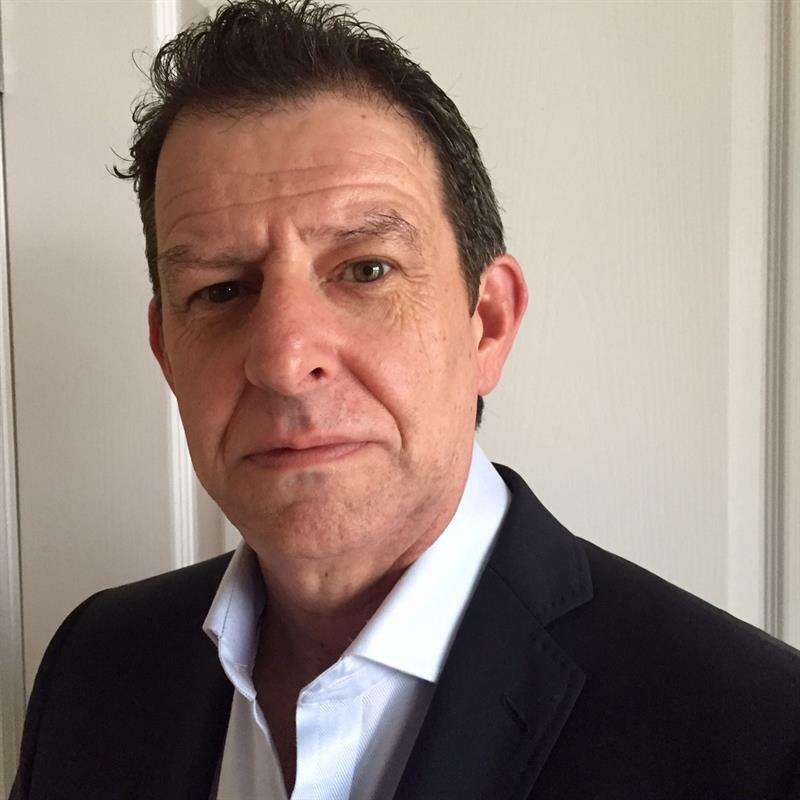 While we are very well known in our key markets as a public safety solution provider, we’re increasingly being recognised in some of our new markets like North America and Australia, and also in some of our traditional core markets in Europe, as a turn-key network provider rather than a device producer. The benefit for the customer is they get an end-to-end solution from one supplier, which reduces both the technical risks as well as the complexity for them in their procurement process. Our network components and systems are fully backward compatible, maximising investment protection for the customer.At the same time, we operate with open industry standards, not locking in the customer. Crucially, they get a partner rather than just a vendor. Two topics you have been speaking about are lone worker protection and middleware. What is happening there? Lone working is quite a complex area; it’s driven by a number of factors, including legislation. But most good employers want to be in a position where they actively protect their employees. Having solutions that help them to do so positions Swissphone very well; it draws on the strengths that we have from our emergency service experience. We’ve transformed that knowledge from public safety into industrial solutions. Middleware, I think, is going to be really important for Swissphone. The simplest definition of it, is that we provide a central integration point that allows a business to connect mission-critical alarms to mobile devices. While we will be delighted to dispatch messages to our pagers, we also understand that there is a proliferation of mobile devices. So the ability to send those mission-critical messages and information to a broad range of devices such as email clients, smartphones and in-building Wi-Fi phones is vital – and we can handle all of that. Coming back to lone worker solutions, what does Swissphone have to offer now in that area? The first thing is to ensure that the solution helps an employer comply with the relevant legislation in their territory. In the UK, for instance, if an employer puts somebody into a location which is potentially hazardous and they’re working on their own, they must provide a solution that allows a lone worker to raise an alert. Swissphone has a number of solutions in that area that can monitor alarms. If somebody feels that they are in danger and needs to summon help, they can inconspicuously call for help. Our algorithms precisely monitor things like falls or if somebody faints. We can have polling intervals whereby the system periodically calls the person and that allows them to say, ‘yes, I’m OK’. In this, you might have to bring together a whole bunch of communications channels? We have to make sure that we can actually get that message back over a number of different channels to provide the resilience in the system that needed. And we can integrate with third party systems, now and in the future. From the customer’s point of view, both the alarm integration and lone worker solution can be quite complex. Having one platform that allows them to manage it at a centralised point where training, implementation and operations is handled by one partner makes the process so much smoother. We’ve been doing some research work in the automotive industry, and that’s one of those areas where it’s very easy to quantify the business case for middleware. And the broad consensus is that a cost of $100,000-$150,000 per minute of lost production in automotive is accurate. Our solutions aim to provide predictive information. We don’t want to tell the production director that his production line has stopped; we want to tell somebody that unless they do something about their supply chain, it will stop in 15 or 20 minutes or one hour. That gives them the time to mobilise and resolve the problem. That’s one of the market sectors that we are focusing on for this middleware product. We’re talking about healthcare, petrochemicals, manufacturing, IT operations and facility management. Looking ahead, we’ve been hearing a lot about cyber attacks and hacking and vulnerable routers. What can you do for your users in that area? Let’s talk about this in terms of our alerting networks. One of the key points that we’ve consistently made to our customers is the need for a redundant alerting network with back-up power, which is separate from both their voice traffic and IT infrastructure. In the event of cyber-attack that takes down the cellular network, then a fire department would still have their separate non-Internet-connected alerting network. They still would have that ability to communicate with their firefighters and volunteers. We’ve stressed to many customers around the world that however secure a cell-based network is – be it public or dedicated –, if it goes down, it goes down in a big way! Having an independent broadcast network which isn’t reliant on Internet connections, which isn’t on IP networks – which is what Swissphone provides – is really a sensible and secure way of designing their network for the future. Many customers have understood that argument and are putting in independent communication networks. You would think that was a more expensive way to go, but the economics actually do stack up well. We’ve got some great White Paper material that talks about that. Special legal requirements govern lone-worker activities, obliging employers to equip staff with appropriate emergency call systems. For rescue workers too, such as paramedics and firefighters, the provision of an emergency call system is essential. Especially since firefighters and rescue workers may face insults and verbal abuse as well as acts of violence while doing their everyday work. Research shows that such incidents are occurring more frequently than in the past. Swissphone has tackled this need and is now able to offer a practical system solution. For lone workers, the Swissphone TRIO lone worker device, in combination with the SOS-Portal, forms part of a certified personal emergency signalling system (DGUV 139). The device provides both manual and automatic emergency call functions. If the injured person is still capable of acting, he can make an emergency call by pressing the key. An emergency call – together with details of the person’s location – is dispatched. If the employee is in a situation in which he is no longer able to press the emergency signal button, a dead-man or fall detector alarm is transmitted. Depending on customer requirements, the type of alert and location is transmitted either to the predefined operations centre or to all other TRIO and mobile phone devices within the system. Selected receivers can be contacted via paging, SMS, voice, app or SMS. This dead-man or fall detection solution for lone workers is also available as an app for smartphones. For rescue workers, Swissphone offers a dedicated solution based on its hybrid RES.Q alerting terminal. This POCSAG alerting terminal with cellular module and GPS has been upgraded with a SOS emergency call button. Emergency call forwarding is conducted via the Swissphone SOS-Portal, which forwards emergency calls together with position data. At the touch of a button of their RES.Q, rescue workers can thus request help inconspicuously in order not to provoke a further escalation of the situation. But if required, an emergency siren can be activated at the same time – either as a deterrent, or so that the caller can be located within a crowd. The high standards regarding privacy and data protection are particularly significant. The RES.Q sends position data only when the emergency button is pressed; the locating function can be deactivated on the device itself by the emergency personnel. The system is currently being tested by several fire brigades, where the initial experience has been very positive. The first reference reports are expected soon. Swissphone’s SOS-Portal can also be combined with easy-to-install SOS-Buttons, allowing to call for help inconspicuously and quickly in critical situations. Applications include threats in public buildings, department stores, etc. The silent alarm is triggered via the remote SOS-Button and forwarded via the SOS-Gateway to the SOS-Portal. The solution allows both stationary and mobile applications. In mobile applications, the position data of the person seeking help is also sent, thanks to the integration of the SOS-Beacon into the solution. The central control element of the emergency call system is the SOS-Portal, which can be managed manually or automatically, monitoring, controlling and logging all alarms and processes. If alerts are not acknowledged by selected recipients, they can be automatically escalated. The SOS portal is web-based and requires no additional software or hardware. Out of doors, GPS can be used to locate the employee at risk. Indoors, or in areas where the reception of GPS signals is uncertain or impossible, the SOS-Beacon (which broadcasts a unique identity using the Bluetooth Low Energy protocol) can be provided to help locate the incident. At the system’s core is s.ONE, a modular suite which manages all relevant stages in the alerting process. 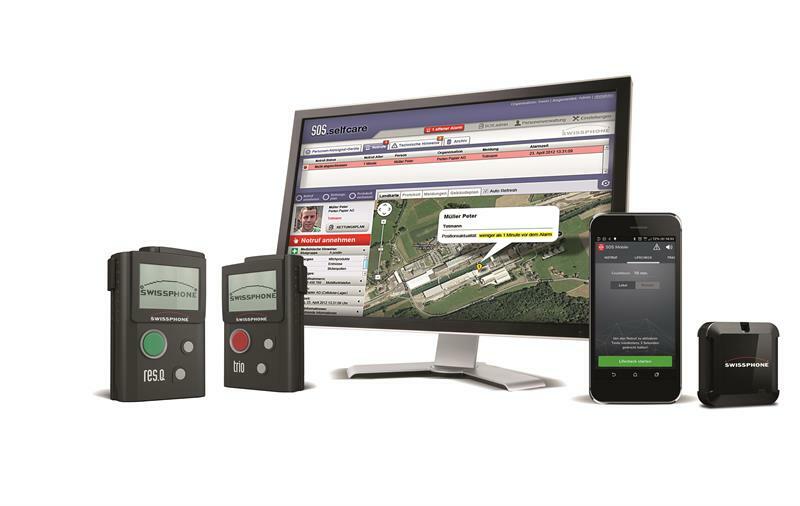 Together with two-way capable devices from Swissphone such as RES.Q and s.QUAD terminals, s.ONE forms a complete solution for alerting, monitoring and resource management. • Before alerting: with s.ONE, dispatchers and station commanders already know which emergency scenarios they can address with the available resources before an event occurs. If any temporary understaffing is detected, measures can be taken before an incident occurs. • During alerting: first responders use their pager to notify whether they are attending. Their answers are displayed on the s.ONE dashboard as an easy-to-read, colour-coded diagram. s.ONE thus provides the dispatcher and station commander with a constant overview of whether enough specialists are on their way and whether it will be necessary to send a follow-up alert. Follow-up alerts can be triggered directly through s.ONE. With s.ONE’s Hybrid Alerting capability, first responders can be reached even if they are beyond the coverage of the alerting network. • After alerting: s.ONE makes it easy to compile reports showing when and how many first responders were alerted and how many recipients responded to the alert, and at what time. Independent of the alerting function, s.ONE also allows pagers to be programmed remotely: this increases security and efficiency by eliminating configuration errors, data such as encryption keys remain protected and secure. Modules within the suite are s.ONE Availability and s.ONE Monitor, which support Swissphone’s two-way capable alerting terminals, s.ONE Alert supporting RES.Q terminals, which can also be alerted via GSM or GPRS; and s.ONE Fleet, which supports all current Swissphone terminals.